WASHINGTON COUNTY – Elim Valley, a housing development located just north of Dixie Springs in the Hurricane City limits, looks like it is finally going to rise from the quagmire it slipped into in 2008; its owner, Roland Walker, had the unwavering determination to survive the housing and development crisis, Elim Valley Controller Rob Robinson said. He even sold some trees. Today, the subdivision’s trees that were planted five years ago are the main thing passersby notice, aside from some street signs, benches and garbage cans. The infrastructure is in place, but so far, only one house stands there. Robinson said lots should start being sold in a month or two once the development completes its “punch list” with Hurricane City. 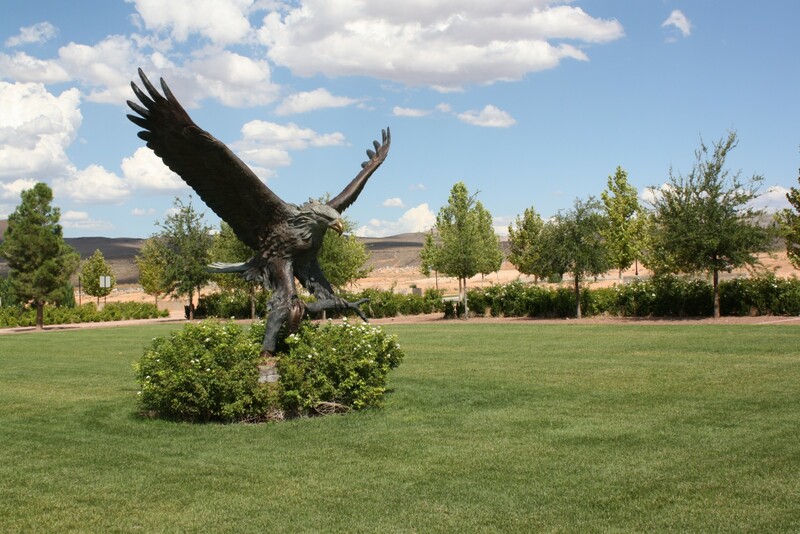 The development is an example of the boom-and-bust cycle of real estate in southern Utah. Stephen Sheffield of Keystone Construction and Design experienced it as well. Carol Sapp, Executive Officer of the Southern Utah Homebuilders Association, said when interest rates rise, so do building permits. And that is exactly what is happening in Washington County now. 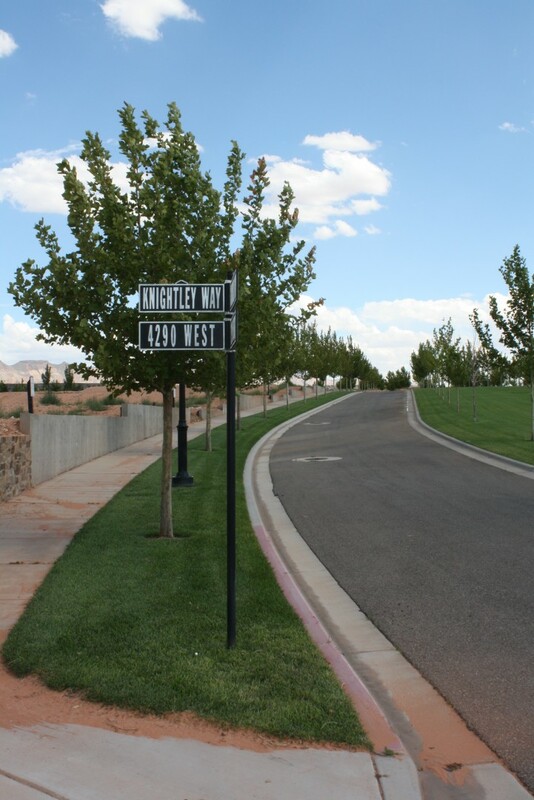 Builders want to take advantage of the rising home prices, leading to more homes rising in southern Utah subdivisions. But this time around builders are optimistic, but less bullish than in 2005, the peak of the last boom. They are still stinging from the 2007-2008 market collapse, she said. According to Vardell Curtis, Washington County Board of Realtors Chief Executive Officer, new developments are concentrated on the east side of the county, including Washington Fields and Hurricane. “Hurricane is one of the most affected as land values are very affordable,” Bob Raybould, a realtor with Vista Real Estate which specializes in Dixie Springs, said. But, Raybould warns the availability and affordability now could cause problems later, including overbuilding. He thinks too many homes are being built on speculation. 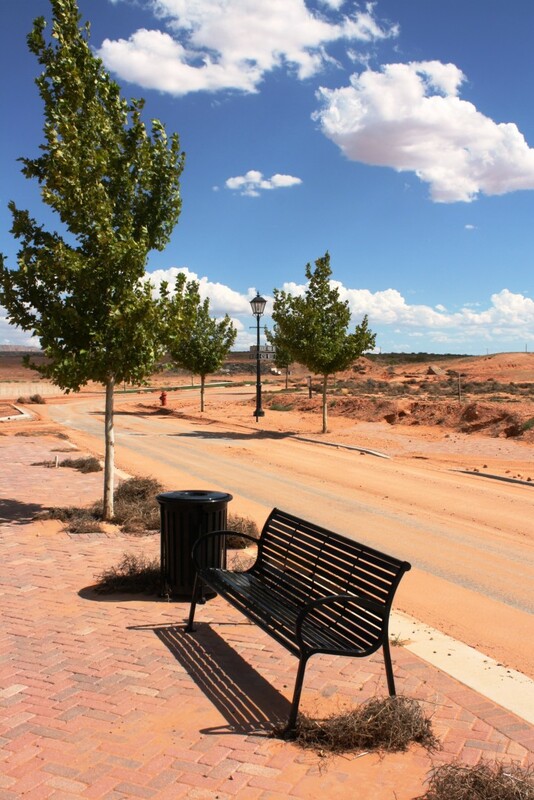 Benches, trees, and tumbleweeds line some of Elim Valley’s streets, July 29, 2013 | Photo by Reuben Wadsworth, St. George News. Raybould says cities must pace growth better to sustain a healthy economy. “More families would avoid hardship in the future if building permits were issued at a slower pace,” he said. The reality is, as Sapp said, build-ready lots are still sitting vacant from 2005. Many previous owners sold lots at great loss but those who held onto them will reap rewards. In Elim Valley, Walker has managed to keep the development and, Robinson said, interest has been strong. Premier contractors, he said, are waiting in the wings to build homes in Elim Valley, including AJ Construction, Richardson Brothers, and Rock Solid Builders. The development hopes to build British and Northern European inspired homes to complement its already tree-lined streets that will provide future homeowners with a canopy of shade. Scheurer Architects, a well-known, award-winning firm, designed some of the homes. Robinson looks forward to seeing construction crews get busy. “Once people see this product, we won’t quit building,” he said confidently. Sheffield is feeling confident as well. Keystone Construction is now building more homes, concentrating its efforts in The Boulders and Boulders Springs Villas near the corner of 1450 South and River Road in St. George. This rise in building seems to make the county feel somehow smaller. As development continues, some subdivisions that felt “way out there” before are now feeling closer. For instance, Sapp said Stucki Farms, a subdivision at the south end of Washington Fields in Washington, felt like it was in Arizona two years ago when she first visited it, but now it does not seem so far away. 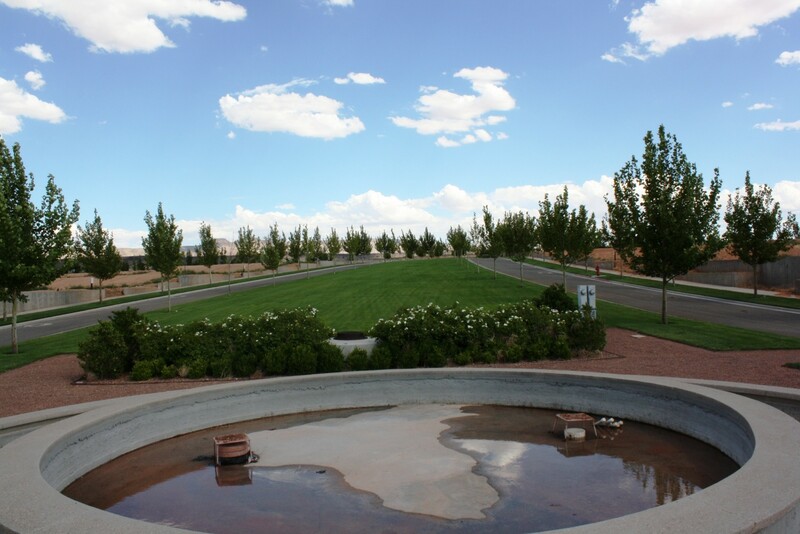 A nearly-empty fountain greets prospective home buyers in Elim Valley’s tree-lined streets, July 29, 2013 | Photo by Reuben Wadsworth, St. George News. Ed. note: First paragraph revised for clarity. Noooooooooooooooo! Don’t “boom” yet…I’m still trying to sell my house in AZ so I can move there! Yyyeeessssss…….boom now! So I can sell my home and move away from here. I have been out there, a nice area to build. Come on with the large expanse of grass!!!??? No wonder the pipeline idiots will win. Put in some fake stuff,im o.k. with that. Hello it’s a desert down here,developers need to know what they are impacting by there actions. Washingtone county uses more water outside the home,than in. You people deserve to run dry of water if you put up with these selfish acts. Elim Valley! What a wonderful place. You can sit there amidst your very own dust bowl! You can smell the stench from the sewer ponds! You can experience the delight of having to fight the traffic that is going to and from Sand Hollow State Park, many of the vehicles being driven by folks who are higher than a kite on dope or booze. Yes, it is such a delight to picture living here! Particularly when the night breeze wafts lovingly across the sewer ponds, carrying the delightful odor of sewage! It will really enhance your outdoor cooking experience. And it is so wonderful to look at the messy mobile home as you come into the place. Why in the world would anyone NOT want to live out here? well great to have opinion I’m one of the afected person already for this will not work development …? why? because you guys already said some contras but here is my best shoot for you and hope at least think about it… who in the hell propose to develope such of stupid idea here must be as seen money money money ambitious persons and investors because Dixie I,II and III.phase is just unconcibable why …The DAM please don’t be Dammed all this developement is in the higher Dangerous places in the whole state just Remember Quail Creek Dam those two Dam are in the very sensitive high risk to get broken who want to risk his family lifes search online and you will find nothing really sweet the Sand Hollow Dam is way higher water levels than all this lands just go south west side of the Dam and you will see what I’m talking about if the risk is 1% many lifes will be….but the risk are way higher and the developements are just in the bottom or mouth of Dam to wash out every single house there. I hope City or state educate about this to all new buyers to have them know these real risk but I doubt because is same H. city the developers so good luck and pass this words or please for your lifes search online first… my only interest is I’m a person human like most with feelings and want to share what I see feel and knows. God bless good intentions and care people…. Thanks for the hilarious article about the future “rise of Elim Valley”. I can hardly wait. It was a dumb idea to build a “little Europe” back in 2005 and it is still a dumb idea. Can we really afford a “canopy of shade”? 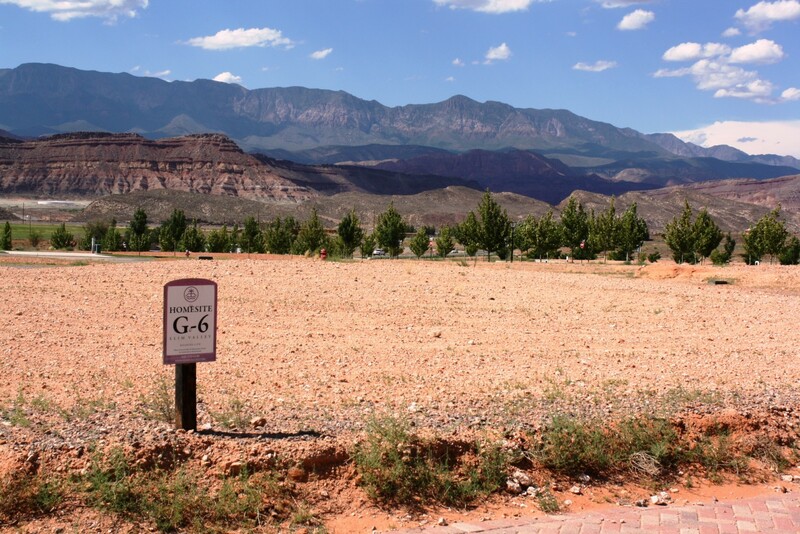 When are the developers in Southern Utah going to wake up and realize that WE LIVE IN A DESERT? I’m disappointed at the complete ignorance blurted out in most of this comment section. Elim Valley is currently a farm. They grow lots and lots of melons and other things and so the idea that water is wasted is simply silly. Don’t cuss farmers with your mouth full. As for grass and trees, this planet needs enriched with oxygen, and green plants make oxygen. If you don’t like grass and trees, go live in the sagebrush and cactus and bathe at least monthly, please. A little European style development? Indeed. The original settlers of the land were of norther european descent, and so it makes sense that the vernacular has some historic realness. You would rather a track stucco home that looks like every other home I suppose. And lastly, what direction does the prevailing wind blow in Hurricane? Enough said.